The Saint Paul Grand Round was envisioned in the late 1800’s by prominent landscape architect H.W. S. Cleveland. Cleveland was hired by both St. Paul and Minneapolis to outline a plan for their respective park systems. 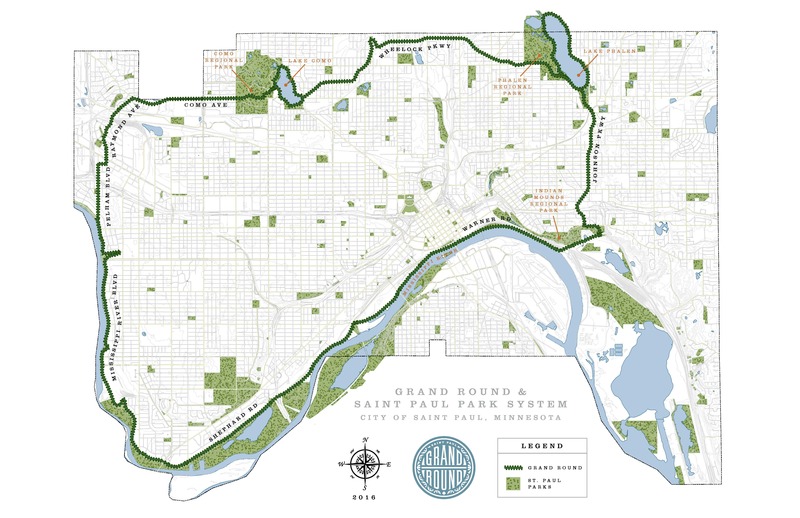 His idea for St. Paul included protection of naturally beautiful spaces along Lake Como, Lake Phalen, and the Mississippi River. The Grand Round was seen as unbroken chain of “parked” ways that connected these larger park spaces that encircled the city. Most of these parkways were installed by the 1930s. The first bicycle and pedestrian trail was installed along Mississippi River Boulevard in the 1920s. Subsequent trails were installed along the southern route of the Grand Round in the 1980s-early 2000s. Currently there is an off-road trail along the entire southern half of the route. The Goal of this project is to continue the development of approximately 27 miles of scenic parkways connecting parks and neighborhoods across the city with pedestrian and bicycle facilities. Funds have been allocated through the Vibrant Places and Spaces initiative to complete a Design and Implementation Plan for the northern half of the Grand Round parkway system and start implementation along key segments. The Design and Implementation Plan is complete and can be seen here. Thank you to all that participated in the over 40 community events, meetings, and activities for the project and/or submitted input about the project. The City has applied for federal grant funding through the 2016 Regional Solicitation for Transportation Projects for the trails along Johnson Parkway and Como Boulevard. Award announcements will be made by the Metropolitan Council in January 2017. Meetings regarding the Grand Round Design and Implementation Plan were completed in May 2016. See below for links to specific construction projects and related meetings. Wheelock Parkway: Victoria Ave. to Dale St.